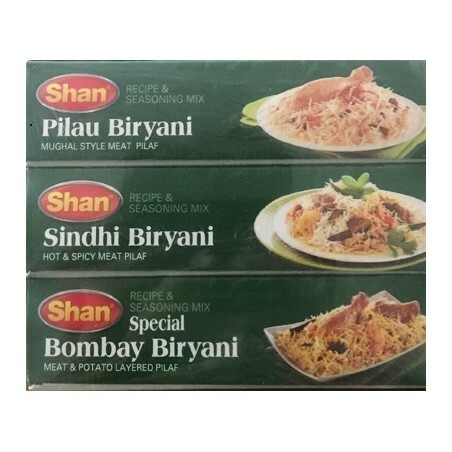 Shan Special Offer! 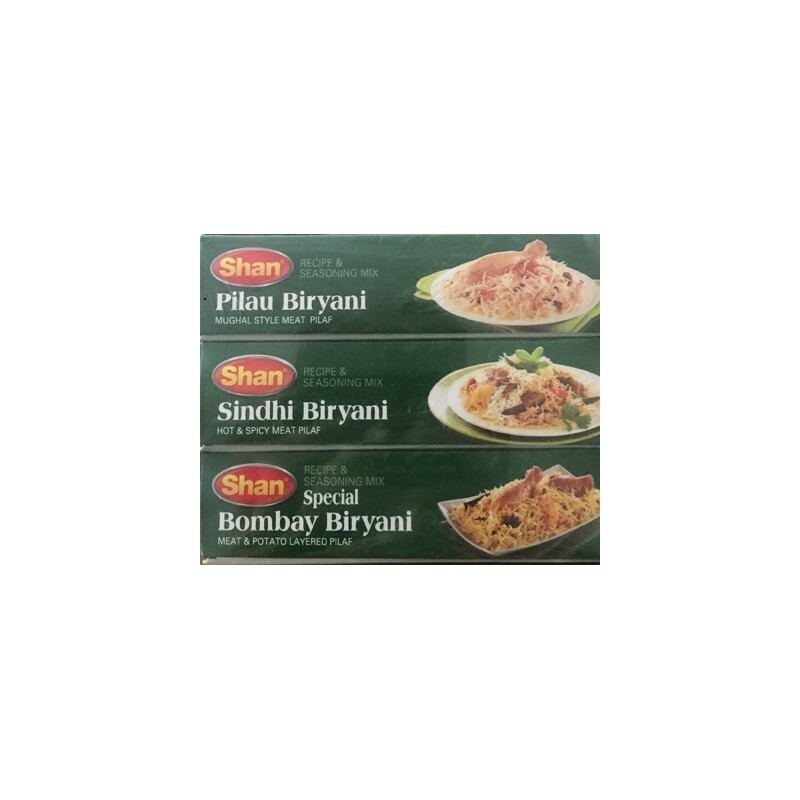 Buy 2 get 1 free in this triple pack containing 1 Pilau Biryani, 1 Sindhi Biryani and 1 Special Bombay Biryani Recipe & Seasoning Mix! Pilau Biryani is a mughal style meat pilaf, Sindhi Biryani is a hot & spicy meat pilaf whilst Bombay Biryani is a meat & potato layered pilaf. Delicious! Special Bombay Biryani Mix Ingredients: Salt, Red Chilli, Dried Plums with Pits, Fenugreek Seed, Dill Seed, Turmeric, Cinnamon, Black Pepper, Cumin, Nigella, Bay Leaf, Fennel, Brown Cardamom, Ginger, Garlic, Clove, Dried Papaya Powder, Maltodextrin, Hydrolyzed Soy Protein, Citric Acid, Cane Sugar, Canola Oil, Natural And Artificial Food Flavour, Silicon Dioxide (anti-caking agent). Pilau Biryani Mix Ingredients: Salt, Garlic, Ginger, Cumin, Bay Leaf, Brown Cardamom, Cinnamon, Carom, Green Cardamom, Clove, Red Chilli, Cane Sugar, Coriander, Turmeric, Hydrolyzed SoyProtein, Maltodextrin, Canola Oil, Natural And Artificial Food Flavour, Silicon Dioxide (anti-caking agent). Sindhi Biryani Mix Ingredients: Salt, Red Chilli, Dried Plums with Pits, Paprika, Coriander, Turmeric, Cumin, Cinnamon, Clove, Black Pepper, Ginger, Aniseed, Carom, Brown Cardamom, Dried Papaya Powder, Maltodextrin, Hydrolyzed Soy Protein, Citric Acid, Cane Sugar, Canola Oil, Natural And Artificial Food Flavour, Silicon Dioxide (anti-caking agent). Suggested cooking method included on packaging. Suitable for vegetarians. No artificial colours or flavours.